We had a very nice Easter Sunday afternoon 3 courses set meal, there was a great choice and the food was delicious and the staff were very efficient. We have visited Erics’s a number of times now and always been impressed. We will be going back. Lovely food and atsmosphere. Slightly lacking in service, delay with drinks order which was ordered before desserts but didn’t arrive until desserts almost eaten. Also coffees ordered with milk, unfortunately waiter had to do numerous trips, forgot milk, forgot sugar and forgot tea spoon so we stirred with our starter forks. Disappointed to see dirty cutlery on the table as well. 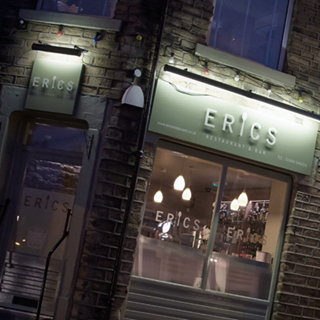 Although our first experience of Erics didn’t quite live up to what we were expecting, we still had a lovely time, the food was delicious and great value for money. We will definately return. Fabulous food! Will be back! 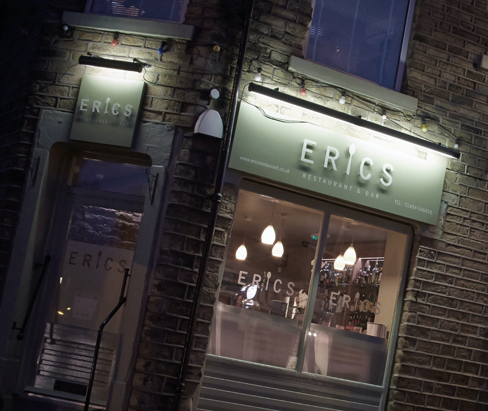 Having been to Eric's Restaurant on many occasions and recommended it too many people, after our recent visit I can't help but feel that the food and general service is on the wane. So come on Eric and all the staff, pick your feet and get back to the excellent ways you once had. Easter Sunday lunch was excellent. Delicious food and very friendly and efficient  service. Top value for money! Enjoyed our early evenings meal once more , love this restaurant . Jake and Illana looked after us from start to finish , wonderful staff . Highly recommend Eric s restaurant , hope to return soon . Had a very disappointing visit, 7 of us were sat on a 6 person table. Spent all night doing a balancing act with my plate as I was placed where the tables met at different levels! Half of the tables first drinks didn’t even arrive till between our starter and main! No one asked if any of our courses were alright and struggled to order drinks as often as we liked. Would have been great to see more staff wondering though the restaurant giving us chance to get more water and drinks. Despite all that the food was amazing and delicious, a shame the front of house let it down. My only quibble was that we felt a bit rushed but hasn’t put us off . Food excellent worth the journey. A lovely relaxed lunch. Thank you. Food and drinks were excellent. Only issue was the restaurant is far too cramped, not enough room between the tables, it was a struggle to get in / out with chairs back to back! Such a shame as it spoiled an otherwise brilliant afternoon tea. We came from York to celebrate a friends 30th and could not be happier. We had afternoon tea and every part was absolutely delicious!! Staff were all very friendly and I looked how Eric himself came round to check we were happy with our meals, a very nice touch! We will definitely be returning as a family with our little Eric to enjoy some more tasty food from the menu. We came for afternoon for a girls afternoon out. Lovely atmosphere, fab food and service. Had another great meal as always. Food was good but we just felt it was rushed. We sat down to our table at 8:10pm ish and had finished 3 courses by 9:15pm.